Looking down on Glen Nevis from the slope of justice side of Ben Nevis. Going for a hill run before breakfast has been a fun and not so serious way to get outside on rest days, look at new crags and burn some ‘Jabba’ as they say in Glasgow. However, in order to run on this type of fuel, one needs the right enzymes. Normally it takes a good four or five runs on jelly legs in a cold sweat to build up enough to be able to keep going without liver glycogen eventually getting raided and everything coming crashing to a halt. But every year I forget that the body needs some time to produce the right biological tools to run without sugar. I didn’t help myself by doing writing work until 4pm either. So I had a sandwich breakfast to ‘prime the pump’ and headed for the slope directly up the side of Ben Nevis above Polldubh. It’s the highest slope in Britain, no path and steep tussocky heather and boulders all the way. So I figured going in a straight line right up it would be a fine way to cancel out a fair number of cakes. Swimming up through the bracken of the Polldubh crags passed quickly and I go onto the monster slope above, trying to keep a good heart rate. Everything was fine until fairly high on the Ben I got that tell tale all consuming desire to sit down. I’d made another rookie mistake in timing my tunes wrong for dealing with this situation. I was listening to Bridget Kendal’s World of Ideas. Great food for the brain but not exactly listening to push you through the lactic barrier. I should have known that this kind of thing is for dancing along ridge tops, and that thrash was made for 1300 metres height gain at near max heart rate. It’s quite amazing. Without the enzymes to turn fat into ATP, nothing happens. You can keep trying to go up, but when the glycogen tank is empty and the reserve fuel pump is not connected, legs don’t work, simple as that. 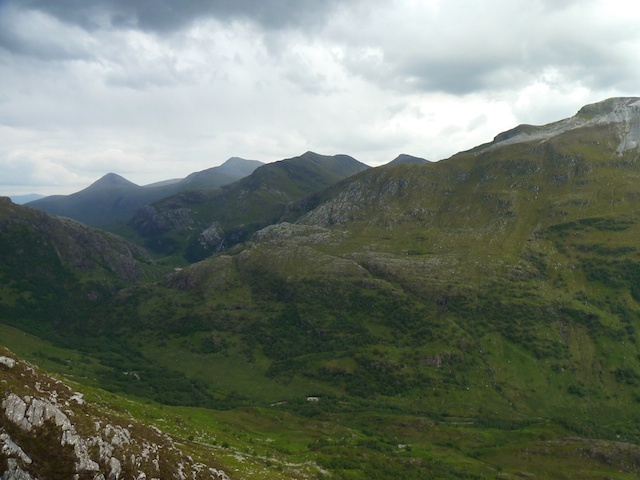 And so I turned on my heel and slithered down crags and boulders into the mugginess of the Glen far below. Some calories burned at least, if mostly sugar. And the view and the feeling of being actually hungry for your tea is really nice too. I also wanted to recce this route for a crazy idea I have. And I answered some questions about it! i.e it's not the way to go! As I ran and felt so unfit, while thinking about how unfit I feel on my Steall project. It became clear to me that endurance is really my nemesis. And since endurance is gone before you can say 'bouldering phase', it's a nemesis that keeps coming back. It would be easier for sure if Scotland had more steep sustained sport routes to keep me going. But that's not really the issue. The problem is that I've had to spend so much time trying to get stronger fingers to be able to do the moves on the routes I want to do, there isn't much time left over to get fitness. For a few brief moments in my climbing career, I've been faintly stamina fit. But most of the time I grunt my way through on sheer tenacity, pumped solid all the way. I'm feeling the need to experience that feeling of 'le resistance' again, even if it's only for a a couple of special routes. That’s the fourth session on my project this week, every one with progress to speak of. So I can’t be close to my limit yet. Yesterday I was with Michael instead of alone on my shunt. I made the big step of linking from the start of the Ring of Steall crux to the top of my project. It’s the first time I’ve felt like I was linking on a route instead of doing hard bouldering moves on a rope, if you know what I mean. I know that to have proper attempts to complete the route, I need to be at a stage where I’m really confident on the moves and don’t feel that they are low percentage. So now I’m getting the Ring of Steall crux static which is good progress. I can’t be fully confident until I’m actually getting highpoints on the headwall above where the route leaves Ring of Steall. Although I’ve got very overlapping halves on the route now, there is still one more big step to make before it’s time to get properly serious. I must get myself through that desperate cross through move. The other thing is that conditions have been perfect. Yesterday it was 9 degrees on the drive up the glen! Windy too. Warm weather has to come sometime and that might put me back a bit in the coming few weeks. Although I feel strong (for me) and climbing not bad, my power endurance still feels about 50% of what it could be, maybe less. The past week has been great. Totally the right decision to take advantage of relatively midge free windy conditions to get more time and confidence on the route. Although my more dedicated power endurance training on the circuits has been delayed, it will be all the more useful when I’m finally forced indoors by the weather. If wet or midgy weather comes next week and I have a stint of circuits and runs, I could be in good shape for starting redpoints after that. If conditions stay windy, I have a backup plan of trying a new link up of Fat Groove (8a) into Maxwell’s Demon (8b+) which is pretty much perfect endurance training. It has some good rests so it might be 8b+/8c. I can have two or three good attempts on my project and then get a workout trying the link-up. Today I can see the midges outside my window as I write (they are after the CO2 from my boiler exhaust!) and the trees are totally still. Board time! 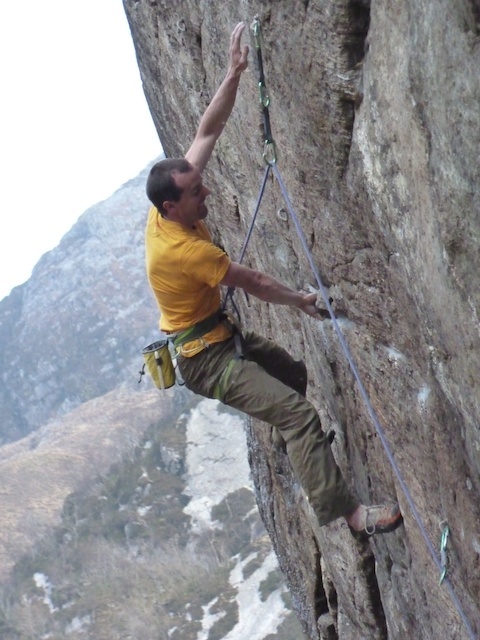 Current highpoint on my project at Steall - a horrendous gaston/cross/backhand/fingerlock move to a perfect little edge I have to hit with my fingers and thumb in just the right spot. In my blog post last night about my recent efforts on my Steall project, I knew that if I said out loud that my sequence wouldn’t couldn’t be improved much, I’d immediately prove myself wrong. And so it was. Today, With fresh body and mind after a seriously needed rest day I found five new bits of of beta which help my sequence. Of course, most of them are small; a change in body position or momentum in the move. But one change in particular might make a significant difference in how consistently I can get to my highpoint. So maybe I can get a little higher sometime soon? I still am two steps (links) away from doing proper redpoints. I have yet to climb from below the Ring of Steall crux to the top. That’s a pretty important link that still feels a good bit away. After that, the next important link is from the ground to two moves higher in the crux than my current best effort. If that ever happens I’ll be on seek and destroy mode immediately. I’m feeling good enough on it to justify keeping on training my endurance on the route, at least for another session. Maybe next week I’ll do some targeted training elsewhere in case I get stale on the route. It’s helping that England is currently getting the chains of rain bearing fronts that we normally get up here right now. Apparently thanks to the Jet stream? In the easterly today it was around 13 degrees at Steall with a 30mph wind. Sticky holds and even the hungriest midge grounded. A good session! We’ve just added three new products in the shop. Vertical Sailing and Welcome to the Hood DVDs, two of my favourite climbing films from the last few months. We also just added the much awaited new edition of John Sherman’s uber book on techniques, tactics and training for bouldering; “Better Bouldering”. I’m definitely bias in being excited to see it since I’m a co-author! I wrote the chapter on training, with some perspectives on gaining strength without turning into the ubiquitous steely youth you see in every bouldering wall who never seems to actually get V-Hard problems done on the real rock. I’ll do a full review shortly but for now let’s just say it’s a five star book and the best dedicated boulderers handbook out there. [Update, oops it was super popular and we sold out of our initial stock of Better Bouldering in a few hours! We'll get some more in shortly and let you know when it's in). Made by the best adventure big walling partnership on the planet right now’ Nico Favresse, Olivier Favresse, Sean Villaneuva & Ben Ditto, this DVD is the most entertaining climbing movie I’ve seen in a good few years. I’ve watched it several times, and in between laughing out loud at the hilarious situations they end up in, I’m awed, inspired and highly jealous of the adventure they take us on. The film starts of in fine style with hilarious team vomiting as Captain Bob Shepton’s tiny yacht sails them through rough waters up the Greenland coast. Over the course of several films, the team have perfected expedition filming like noone else I’ve seen. From the footage you would really think they had a film crew with them. But it’s just that they have it so dialled. Some footage of stunning granite fjords and onsight new routing of 400m E6 6bs follow. But that’s just the warm up for the impossible wall. 1000 metres, great granite, but this isn’t Yosemite. There are grassy cracks that look desperate, fulmars, loose rock days waiting out storms and a ridiculous wet chimney. You would think that footage of a wet greasy overhanging chimney pitch pouring with water would make for a laughable short clip but would be a lot more ‘entertaining’ to climb than to watch. But for me this is probably the highlight of the film. It absolutely captures why we climb routes like this instead of just going on chalked up sport routes all the time. It looks frightening, totally out there, dangerous and apart from all that, unclimbable. So watching Villanueva thrutching his way up it Gore-Texed to the hilt with water everywhere is excellent. Not many films could shoot this sort of terrain and make you wish you were there. There is the usual portaledge partying which the Belgian team have made their trademark. By the end you are left with a feeling that you could go to the most ridiculous corner of the vertical world, climb the most desperate and committing thing you can find and just have nothing but laughs all the way. Most uplifting. And your non-climbing friends could watch and be just as entertained and impressed. It’s in the shop here. Fortunately, since bouldering is convenient to film and good cameras like the 5D are so well suited to this sort of filming, we get to see a lot of the worlds best ascents, well filmed often by the climbers themselves. And so it is with this movie of 4 of the strongest in the world just now; Daniel Woods, Paul Robinson, Guntram Joerg and Andy Gullsten. We get to see 8b+s in Font and then over to several Swiss venues. I was particuarly keen to see more from the lesser known venues of Murgtal and Silvretta. I was in Murgtal myself for a session in April and thought it was a lovely place with it’s bouldering potential being rapidly developed right now. The section in Chironico was a great highlight. Interesting as always to watch and learn from the contrast of movement style and strengths of the different guys. Even at their level their styles are quite different. The finale of Woods’ flash of Entlinge 8B+/8C (the hardest bouldering flash in the world to date) is jaw dropping. What a machine. Essential dose of viewing for boulderers. It’s in the shop here. If you didn’t catch my blog post last night we also have just put a good sale on with about half our products discounted by 25-50% for a month. It’s been super popular today and a few things are selling out or getting close to it. So do have a look. Mountain Heroes - Lovely and substantial coffee table book of superb and iconic shots of many of the world’s most influential climbers. We sell a lot of these when we run stalls at festivals because as soon as folk pick it up they see it’s a lovely book. We quite often sell them two at a time becuase folk buy it for a gift and then decide to take a personal copy too! Previously £30 (like I said, it’s a big substantial book). On sale at £22.50 here. Folk at lectures often ask me to sign the page with my picture. Just ask in the checkout page if you’d like this. (UPDATE - now sold out) Extreme Alpinism - Mark Twight’s seminal book on techniques and approaches to alpinism. A bit of a bible really. Was £20, now £15. Mountain Equipment Beanies - Warm, and comfy for anything from bouldering to winter alpinism. On my head about 250 days in the year (OMG!). We have various colours in the branded version and the plain version. Was £15, now £12 here. (UPDATE - now sold out) Ron Fawcett, Rock Athlete - Hardback edition of the great man’s autobiography. An interesting time in climbing and always much to learn from characters like Ron. Was £20, now £15. 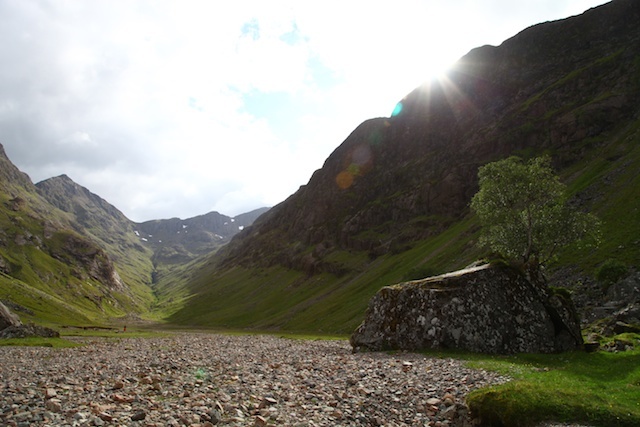 Hostile Habitats - It’s a book that often comes out in conversation with owners of it, since it’s so full of fascinating details about the landscape, flora and fauna of Scotland’s mountain environment. If you are planning to spend your life in these mountains, it is frankly crazy not to make yourself aware of the richness of interest all around you, from geological features to the lichens that colour the rock so beautifully. I first became aware of the book when Tom Prentice appeared above me as I sat on my boulder mat at Dumby, He was taking pictures of the gas pockets in the Basalt I was climbing on. I had no idea they were gas pockets. These days I look at the places I go to in Scotland with a new pair of eyes, and take so much more from being there thanks to the knowledge in the book. Was £17, now £12.75 here. (UPDATE - now sold out) The Players DVD - Dave Graham, Chris Sharma, Emily Harrington, Daniel Woods, Lisa Rands, Joe Kinder, Alex Puccio, Chris Lindner, and Ethan Pringle. 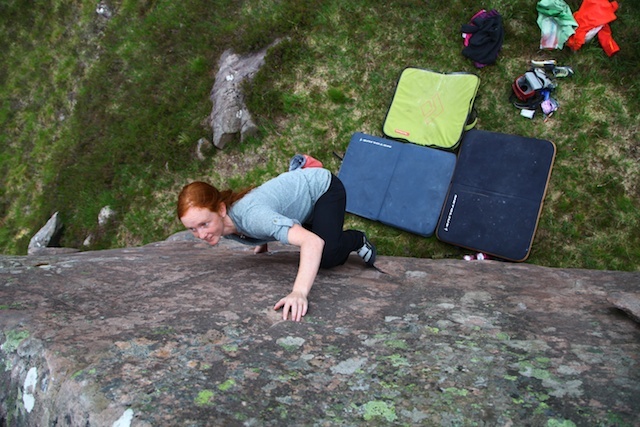 9as, Font 8cs, E10 trad, Deep water soloing. A ton of great climbing footage and a ton of learning from the best movers on rock. End of. Was £20, now £10. Northern Beats DVD - Bernd Zangerl and friends on tour opening new boulders in Norway. Amazing rock, impressive movement, good music. A psyche hit! Was £10, now £5 here. (UPDATE - now sold out) The Mountain Marathon Book - A hill racer’s bible. If you’re thinking of entering your first hill race, or trying to move up the rankings, it doesn’t make much sense lose out on to make one of the mistakes this book will save you from making. It’s a young sport and this is the first good instructional book on the subject. Was £20, now £15. The Munros in Winter - One way to look at it is ‘it’s a book about hillwalking’. So why is it so inspiring? Well something to note for starters is that it’s author the great North West Highalnds pioneer is now (in his 50s!) one of the best winter climbers in Scotland, regularly hillwalking grade VIII mixed routes and IX if he’s looking for a more serious ‘day on the hill’. This book is about an extra long day on the hill - he got in his van, drove to Scotland and did the first completion of the 277 Munros in a single winter season. I first read it as a 15 year old and was left utterly inspired to explore these mythical corners of the highlands. It’s a much, much better way to learn about these mountains than reading a standard guide book, that’s for sure! A great story about a great effort from the softly spoken man machine. Was £15, now £11.25 here. We just halved the price of our slack line sets from £120 to £60. We don’t have many left so if you are keen, best get them in now. Good time of year to have one, I’d say. They are in the shop right here. We also have Tip Juice back in stock for the worn out skin on your fingers. Although I use this most days myself, I got to give it a real test with daily usage on my hands in the dry alpine climate of Switzerland. For a 2 month bouldering trip I did pretty well to have good enough skin to only use tape once (a serious gouge from the start hold on Mystic Stylez). A tub is £9 and you’ll find it in the shop here. Since getting home from my travels I’ve been doing all the necessary tasks of settling in and getting out to climb in some new places. 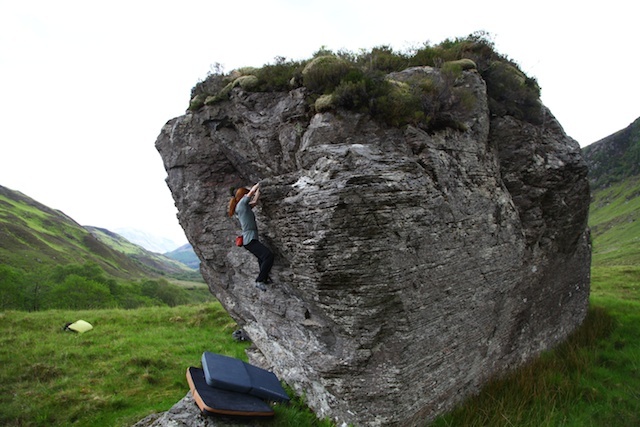 With Alicia I checked out the Lost Valley boulders in Glen Coe. There’s definitely some new stuff that I’d come back for another look at here. In fact I cant believe more problems haven’t been recorded in this beautiful but very accessible location. 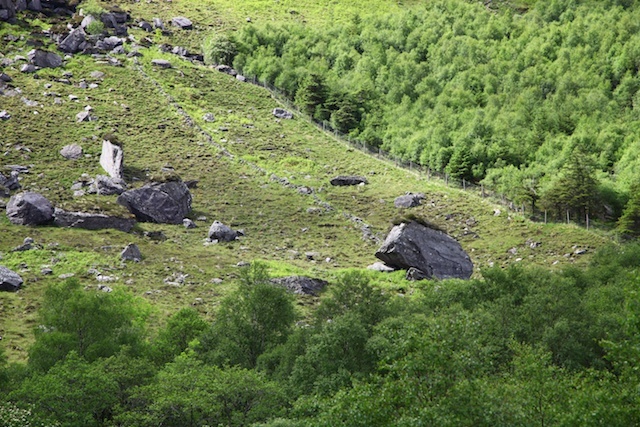 We also looked at some untouched boulders in Glen Elg. There’s room for 50 or 60 porblems here. We did three fantastic ones from Font 4 to 6b+ on excellent crimpy gneiss in about 15 minutes but we got the wind forecast wrong and the midges called an immediate halt to proceedings before they got started. This is primarily a venue for 6s and 7s, although there are a few harder things to do. It was too midgy to brush our problems first so if you go, take a wiry with you. After driving past the famous brochs, park at the road end and walk up the farm track for 10 minutes and you’ll see the boulders over the river. 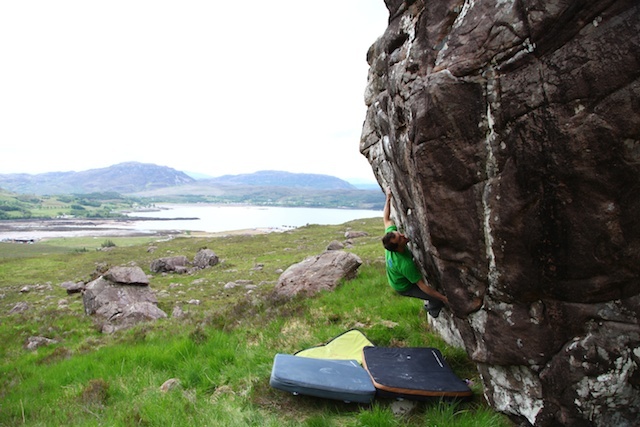 Instead we drive round to Applecross and I ticked Mike’s Problem 7C+ which is a beautiful problem. 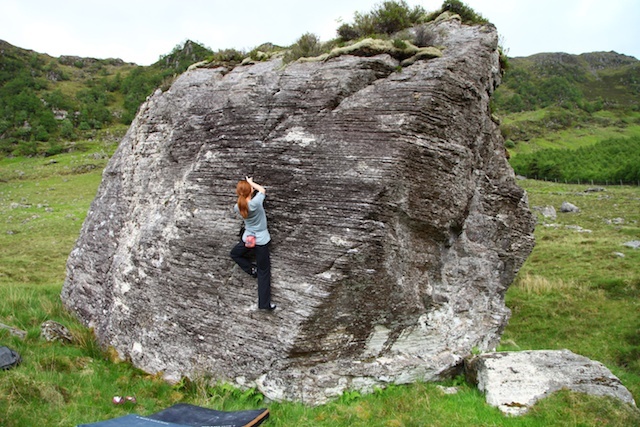 I’d been to the boulder once before about 6 years ago and had a ten minutes on it while it was still unclimbed. I never quite got round to going back. We rounded off the day with a jog to the top of the Bealach na Ba and back, which after 2400 miles in the car the previous week felt more uphill than it should have. Lovely Font 5, Glen Elg, first ascent. As well as enjoying the almost endless new venues (never mind new routes) and repeating other peoples climbs which is a novelty for me sometimes, I'm on the lookout. I know that at some point, in one of the new places, I'll find really amazing lines which are worth getting really obsessed about.